Christmas is one of the most romantic times of the year to get engaged and one of the most popular too. 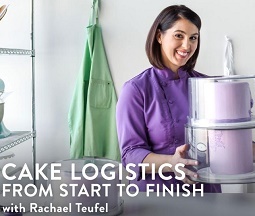 So now is the time to get your cake business ready to promote engagement cakes for the festive season. 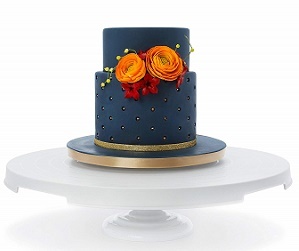 Engagement cakes can be a great way to boost festive cake sales especially when the margin on Christmas cakes is quite low for specialty cake decorators. 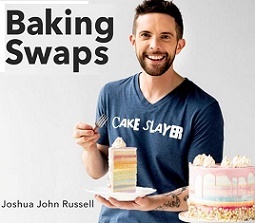 Plus, if you do a really good job on the engagement cake, chances are you will get the couple’s wedding cake order too. 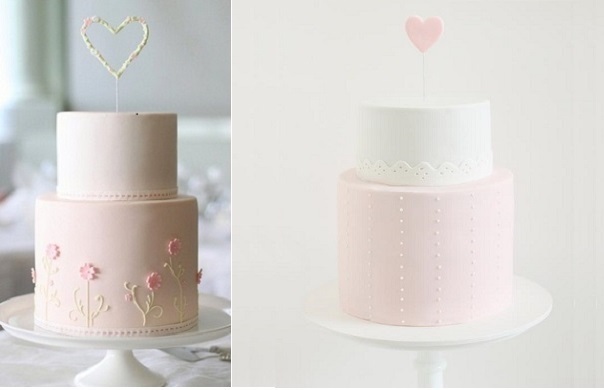 To inspire you we have two beautiful engagement cakes above, on the left from Pinterest and from the right from the Hostess With The Mostest store. 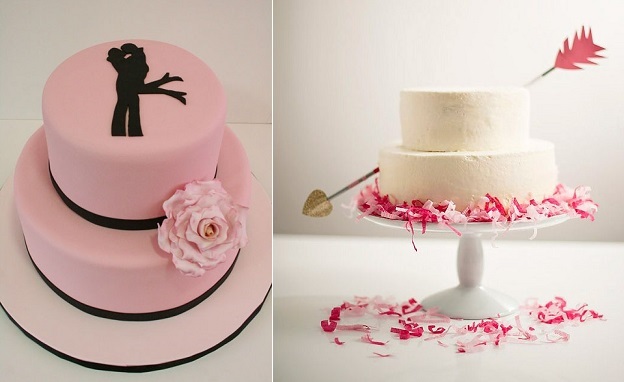 The simple black silhouette on the first cake captures the excitement of an engagement announcement perfectly and the pink and black colour scheme is both striking and pretty at the same time. 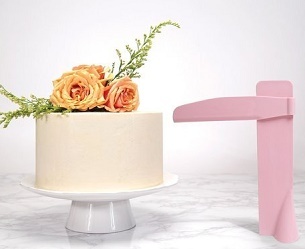 The cupid’s arrow cake is a really fun cake idea and bound to entertain all the party guests. The arrow is simply a metal barbecue skewer with paper quills and arrow attached at each end. 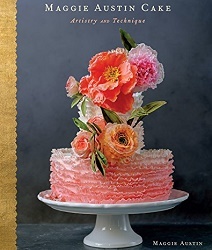 Shredded crepe paper in deep pink and light pink adds even more party spirit to this fabulous cake design. 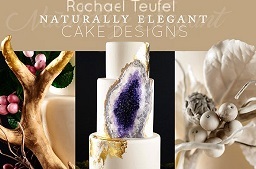 Above we have two ultra pretty engagement cakes from renowned Australian cake design company, Hello- Naomi. 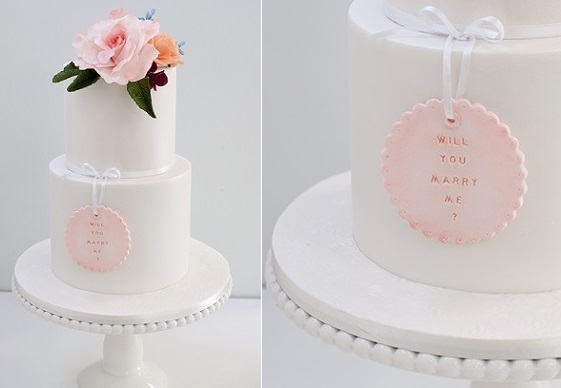 And what a gorgeous proposal cake below from Janet O’Sullivan Cake Design with a beautiful letterpress message plaque. 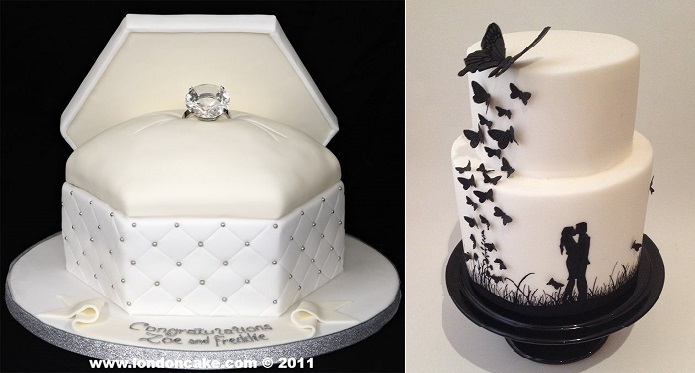 Next we have a classic ring box engagement cake from London Cake (left). 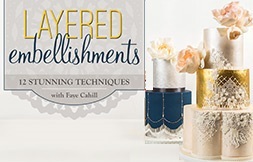 For gentlemen looking for ways to propose to the love of their life, this is a great way to do it – take your girlfriend to dinner and when it comes to the dessert course, have the waiter bring out the “proposal cake”! If your girlfriend would like to choose her own style of ring (which most girls do), this proposal idea is perfect. 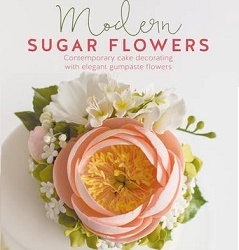 Your cake maker can use an edible sugar diamond to make a temporary ring for the cake…. 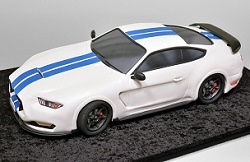 then you and your fiancee can go ring-shopping for the real thing. 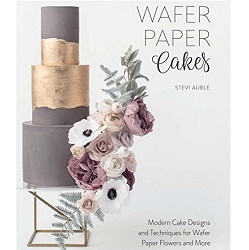 Above right, we have a quintessentially romantic black and white silhouette cake from Susie Kelly Cakes which would make a very striking centrepiece for an elegant engagement party. 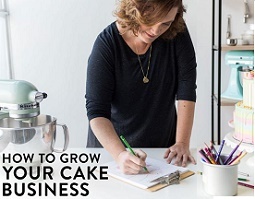 To make a silhouette cake, first of all print off a pattern or design you would like for the cake, then cut around it carefully. Place this over your black rolled out paste, and using a craft knife, carefully cut around it. Leave it to dry for two or so days before moving. 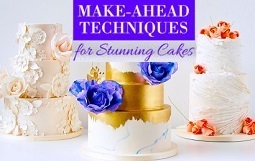 Wilton has more instructions here together with a printable engagement couple silhouette: how to make a silhouette cake, plus pattern. 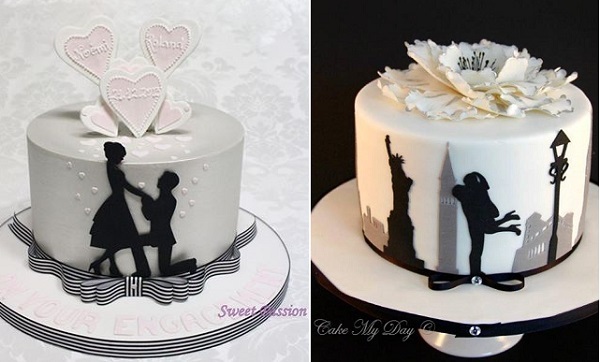 Vintage and metropolitan style silhouette cakes above create timeless romance in monochromatic colour schemes from Sweet Passion above left, and Cake My Day, above right. 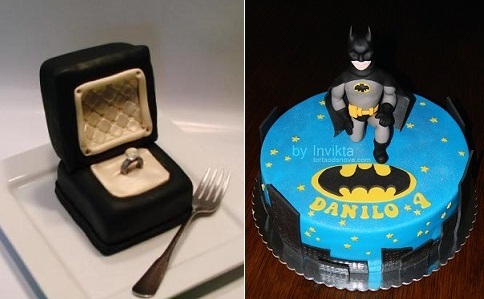 Below left, a vintage black and white engagement cake (from Michelle Wells via Pinterest) and engagement cupcake (via Little CupCakery NI Facebook page), which is also a very sweet idea. 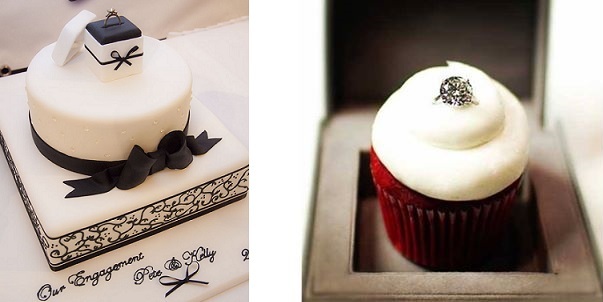 Cupcake Envy have created the beautiful Chanel-style quilted ring box engagement cake below left. 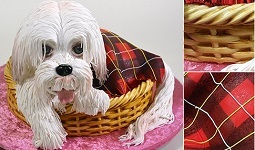 But if you really want to bring a smile to her face and you’re a super hero fan, then the cake below right from Invikta on Cake Central is guaranteed to do just that. How could a girl could say no?! 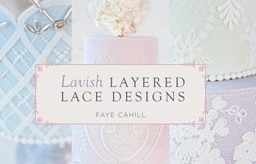 Readers might also be interested in our features on Vintage Jewellery & Locket Cakes, Floral Gift Box Cakes, Floral Framed Cakes, Vintage Hatbox Cakes, Cupcake Bouquets, Secret Garden Cakes/Key To My Heart Cakes, Vintage Floral Piped Cake Tutorial, Vintage Pearl Cakes, Sequins Cakes & Tutorials, Beaded Cake Designs, Jewelled Cakes, Jewelled Sugar Flowers and Valentine’s Cakes. 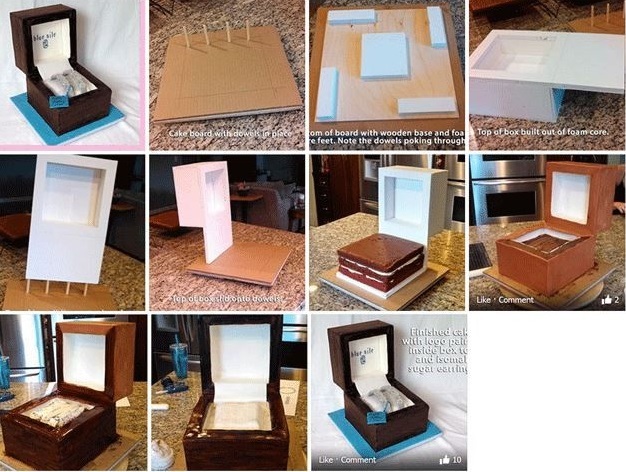 Update: Below you’ll find a picture tutorial for a ring box cake (image via Pinterest, uncredited).